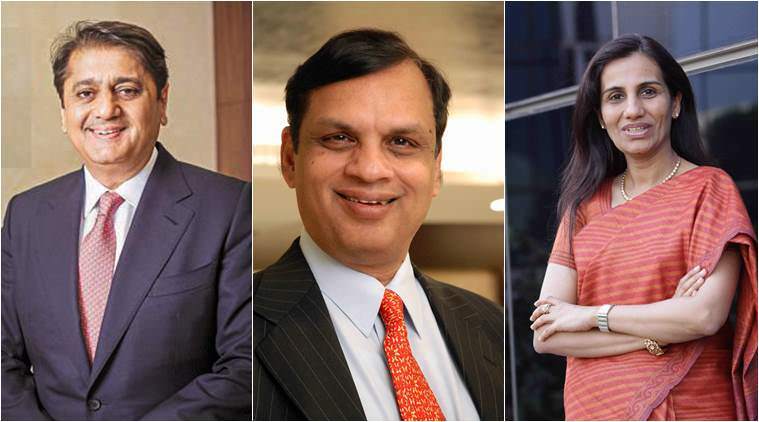 From left to right: Managing Director of NuPower Deepak Kochhar, Promoter of Videocon Group Venugopal Dhoot and CEO and MD of ICICI Bank Chanda Kochhar. In December 2008, Venugopal Dhoot of the Videocon Group set up a company with Deepak Kochhar, husband of ICICI Bank MD and CEO Chanda Kochhar, and two of her relatives; then gave a Rs 64-crore loan to this company through a fully owned entity before he transferred the latter’s ownership to a trust headed by Deepak Kochhar for just Rs 9 lakh, an investigation by The Indian Express has found. 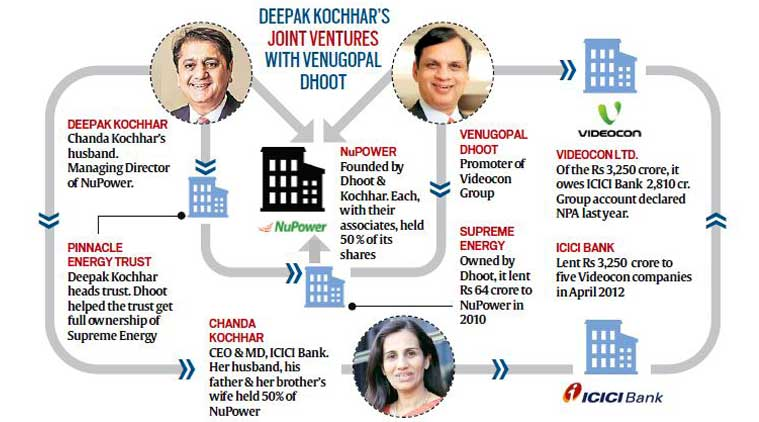 In what raises questions of propriety and conflict of interest, the transfer of the company to Deepak Kochchar happened six months after the Videocon Group got a loan of Rs 3,250 crore from ICICI Bank. Almost 86 per cent of that loan (Rs 2,810 crore) remains unpaid and Videocon account was declared an NPA in 2017. Sources have confirmed to The Indian Express that the Dhoot-Kochhar-ICICI web of transactions is being examined by investigative agencies. The statement, however, did not address the specific query from The Indian Express on Deepak Kochchar-Venugopal Dhoot transactions or the conflict of interest. * In December 2008, Deepak Kochhar and Venugopal Dhoot set up NuPower Renewables Pvt Ltd (NRPL). Dhoot held 50 per cent stake in the company with his family members and associates. Deepak Kochhar and Pacific Capital owned by Deepak Kochhar’s father and Chanda Kochhar’s brother’s wife held the remaining 50 per cent. * In January 2009, Dhoot resigned as director of NuPower and transferred his 24,999 shares in the company to Kochhar for Rs 2.5 lakh. * In March 2010, NuPower got a loan of Rs 64 crore (as fully convertible debenture) from a company called Supreme Energy Private Limited which was 99.9 per cent owned by Dhoot. * Following a sequence of transfer of shares from Dhoot to Kochhar and then from Kochhar and his relatives’ Pacific Capital to Supreme Energy, Supreme Energy became a 94.99 per cent shareholder in NuPower by the end of March 2010. Kochhar held the remaining 4.99 per cent stake in NuPower at the time. * In November 2010, Dhoot transferred his entire holding in Supreme Energy, to his associate Mahesh Chandra Punglia. * Beginning September 29, 2012 to April 29, 2013, Punglia transferred his holding to Pinnacle Energy, a trust, where Deepak Kochhar was the managing trustee. The total transaction value of the complete transfer of shares from Punglia to Kochhar’s Pinnacle Energy trust: Rs 9 lakh. In effect, Supreme Energy gave a loan of Rs 64 crore to NuPower and then got subsumed by Pinnacle Energy within three years. ICICI Bank did not respond to queries sent by The Indian Express on these financial transactions, share transfers between Dhoot/Videocon companies and companies run by Deepak Kochhar, and on the issue of conflict of interest. NuPower stated the same in its response to the email sent by The Indian Express. However, Registrar of Companies filings of Supreme Energy show that Dhoot owned it until October 2010 and then transferred his share holding to Punglia in November 2010. Nupower also said that it has no concern or connection with ICICI Bank’s lending to companies owned by Venugopal Dhoot. As of March 2017, for which latest RoC records are available, Deepak Kochhar held an aggregate of 43.4 per cent in NuPower both as direct holding and through Supreme Energy and Pinnacle Energy. The remaining holding is with Mauritius-based DH Renewables. As of March 31, 2016, Kochhar along with Supreme Energy and Pinnacle Energy held 96.23 per cent. While the company came into existence in December 2008, it announced net losses in last six financial years. In the six years from FY’12 to FY’17, the accumulated losses for NuPower amounted to Rs 78 crore. In FY’17 it posted a loss of Rs 14.3 crore. ICICI Bank was always dicey in its dealings, not having the same respectability that HDFC bank has. Yes Bank faced some heat a few days ago when the Fortis Hospital scam unfolded. It seems that Yes Bank has the highest exposure to Fortis. Axis bank, for those who remember, used to be the UTI bank and is not really a full-fledged private bank. Congress raaj me acchi bandarbaat huyi hai .. everyone got their share. Very disappointed in ICICI bank ..however, HDFC is a big-time spammer and somehow, I have always had a bad experience with them . Their personal banking service is much better though . WHAT THE FCUK WAS AND IS RBI DOING? Raghuraman Rajan was doing what job exactly? Is Idli economics all he knew? Oh, he was busy receiving "Banker of the year" award. RBI management over the past 70 years should be hauled over coals. Also, all the governments. It seems that the government was happy with RBI as long as they received the surplus from the RBI balance sheet, and that forex reserves were going up. Seems like Chandaben is in a lot of hot water. But ICICI main webpage has support for her from the board. Yeah, they have full confidence, though a lot of people outside the Bank think that she should proceed on leave till the matter is hot. But all kinds of outsiders are getting involved - CBI, SFIO, ED, IT and what have you. good thing I pulled money out of ICICI last year, wondering if I need to dig a pit in my backyard and put the money in an earthen pot, or may be convert to gold ornaments and become Bappi Lehari like sone ki dukaan. Dont buy gold ornaments but gold coins and biscuits. These are a better alternative, but then again where will you keep them? At home? What if burglars break in? You can keep them in bank locker or safe deposit boxes as they are called in Umirka. I am not so pessimistic. The lady for all her loan adventures managed to keep ICICI Bank at top (it is no 2 after SBI which also has a lady Head). NPAs are a part and parcel of banks. They pinch when they grow to the size of the banks like Global Trust Bank -guess Ramesh Gelli (yups another Gult) was handing off loans to his buddies. NPAs are not the only thing. Unlike PSU banks, ICICI Bank* has some people catering to 'High Networth Individuals' and get them to deposit money (one Fellow alum was doing it). Plus they overwork their employees so that the branches stay open till 8 (one cousin's daughter was into this and she quit after she could take it no more). So, they have enough money flowing in. *Before Badriji comes back saying ICICI Bank is a PSU bank, difference is Vijaya Bank, etc. are Nationalized and run by Government of India. ICICI Bank was started by ICICI which was promoted by GOI. So there was no direct government control. ICICI got merged into ICICI Bank so it ate its own parent and grandparent cannot control it. Probably IDBI is like a PSU bank. Chapai is correct. Buy bars .